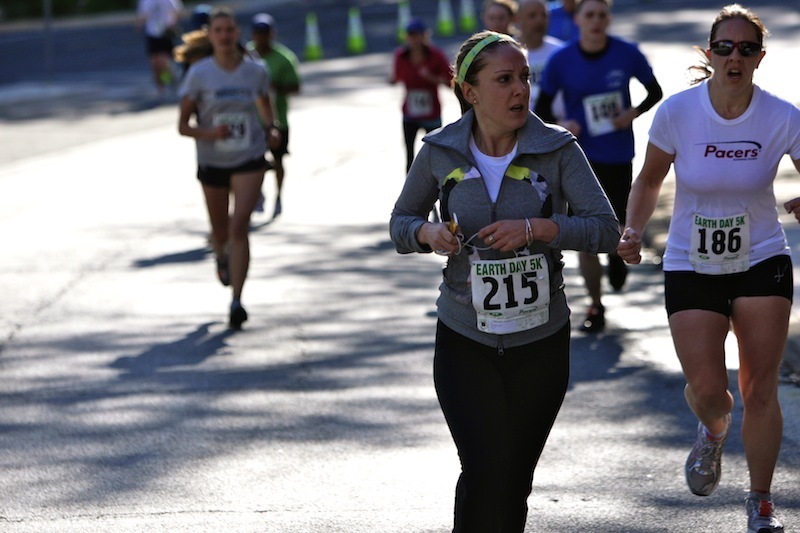 On Monday, I mentioned briefly that I ran the Silver Spring Earth Day 5K on April 30. I told you how I ran with Katie, and how we chatted our way through two easy 9-minute miles to start off, then gutted it out through one hard, hilly one and finished below 28 minutes—a big deal for the comeback crowd! 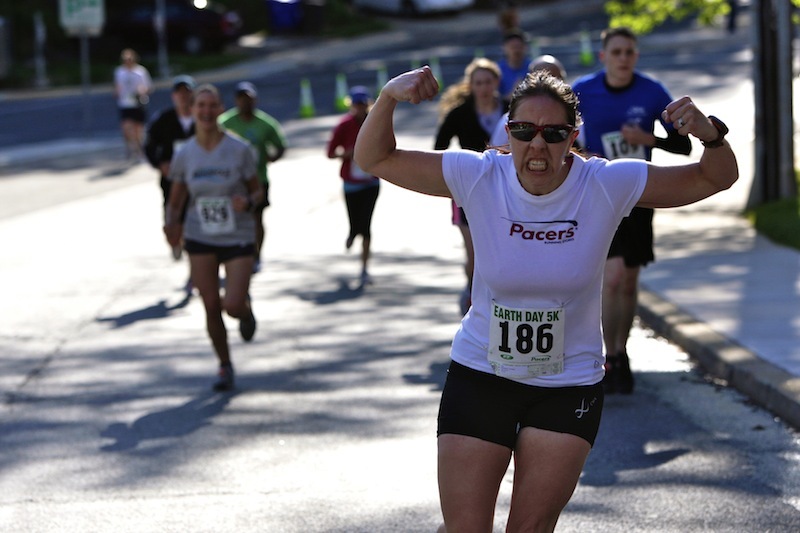 What I did not tell you: These two gimpy girls know how to turn a gutsy run up a steep hill at the end of a race into a party, as evidenced by the photos below, courtesy of Pacers and Swim Bike Run Photography. These were all taken within a few hundred yards of the finish line. You can tell Katie is digging deep and working hard. She’s got her 5K face on for sure. RAWR! The girl she’s about to pass is clearly terrified. But she wasn’t working too hard to ham it up for the photographer. 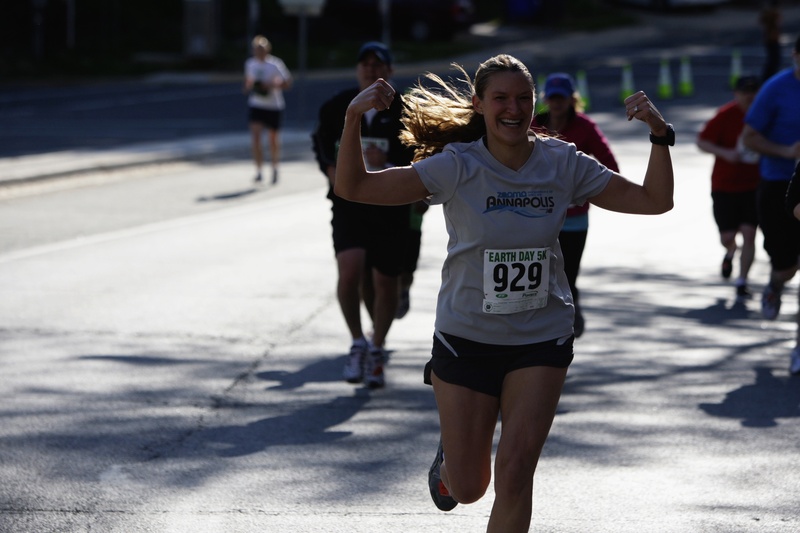 I *thought* I was trying my hardest to catch up, but the fact that I’m grinning like an idiot in the background suggests I prolly could’ve directed a little more energy to the race. I was also not too tired to copy the same idea. I love, love, love the fact that the people behind me are grinning at the silly girls in front of them. 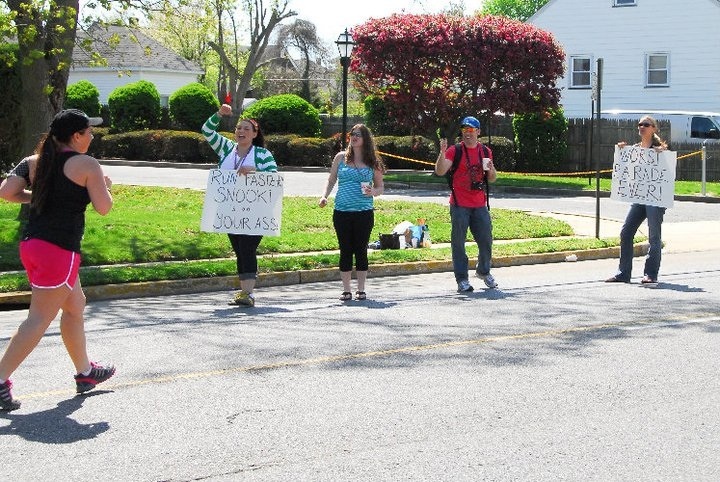 I also love that my quads have apparently skyrocketed straight from “not really functioning after ACL surgery” to “defined in a way that is freakish rather than hot.” Speaking of making runners smile mid-race, I found this photo of me and my friends at the New Jersey Marathon this past weekend in the race’s photo contest on Facebook! My favorite comment from a marathon finisher: “I loved these girls! I wish I had their energy.” Are you racing this weekend? Supporting someone who’s racing? Make a point to do something on the race course that makes someone else smile. Either that, or encourage them to run so hard they almost puke (see above photo of us screaming our lungs out at a poor, unsuspecting stranger). And keep in mind the motto Katie rather dramatically eked out while we were chug-a-lugging up that hill, at a point where neither of us were smiling or flexing or doing anything but trying to survive: Your heart is a weapon the size of your fist. In other news: 50K in May count: 9,000 meters, courtesy of a killer 6,000-meter long swim on Thursday. My heart, head, back and overall body felt strong. My shoulders … eek. Stay tuned for my rotator-cuff lineup to prevent shoulder injuries! I LOVE these pictures! You guys are awesome and I definitely would have been grinning had I been on the course. And yes, way to go on the quads. That’s a huge milestone! Love the race photos. Keep up the advil and shoulder icing as necessary! you are so cute! i look like i’m about to eat someone for lunch. ugh. Love this photo-heavy blog post. Just fantastic pics – no one who looks at these could help smiling! Here’s to fun runs and freakish quads – you look great, Amy!! You’re the sweetest! I wish my secrets included something other than three months of physical therapy … but at least I know those quad extensions were good for something!